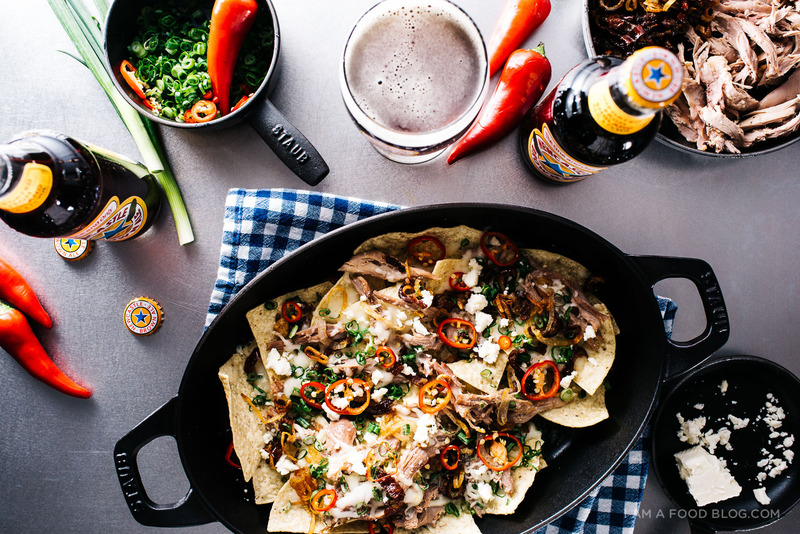 When I think of beer, I think of nachos. And nachos are one of my all time favorite food groups. I’ve been known to make people restaurant hop in search of nachos. One year, my dearest friends and I had the most surreal Christmas nacho experience. We were in a hip (okay, it wasn’t that hip) part of town with tons of restaurants and none of them had nachos. We must’ve gone to 4 or 5 places, looking at menus, until we finally found a place by the water. It wasn’t the kind of joint that we’d typically visit, but at that point we were all fiending for nachos, so we went in. There were neon Christmas lights all over, a creepy Santa in the corner, and cheesy Christmas pop songs playing. It was the best. And for some reason, we all agreed, very very surreal. We felt like we were either in a movie (David Lynch style, all weird and dreamy) or having major deja vu. It was fun and one of my favorite nacho memories. Is it weird that I have nacho memories? It doesn’t seem that weird to me. And, I just created another one! While Mike and I were in London a week or so ago, a major nacho craving hit. 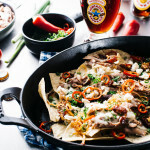 I came up with a nacho idea on the flight in and I just couldn’t get it out of my head: beer-braised duck nachos – specifically Newcastle Brown Ale pulled duck nachos. 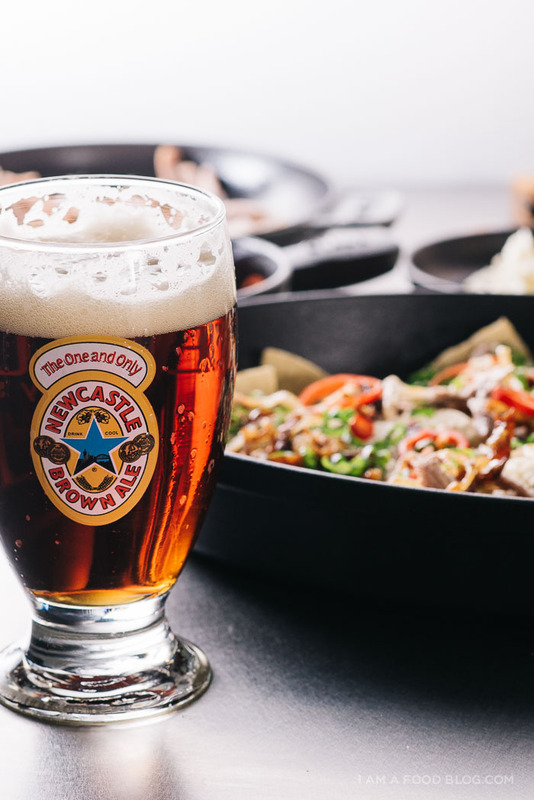 It’s a good thing Newcastle Brown Ale is the most widely distributed beer in the UK (and America’s number 1 imported brown ale! ), because tortilla chips really aren’t. We landed, checked in to our little rental with its even littler kitchen and headed out for some grocery shopping. I absolutely LOVE grocery shopping in other countries. It’s so much fun seeing what the differences are. In London, I’ve noticed that they have a lot of ready-made food. More so than I’ve ever seen at home. Also, they don’t sell tortilla chips. Anywhere. Okay, that’s a lie, but the first night we were there, we hit up two major grocery stores and lots of little convenience stores and I couldn’t find plain tortilla chips anywhere. After a terse night of googling, we headed out in the morning and lo and behold, found the chips. I was tense for a while but it turned out all good! Unlike tortilla chips, duck is a readily available meat in London. I used a duck crown, which is basically a duck with its legs removed, but you can use boneless duck breast or legs, just make sure to adjust the liquid when braising. This recipe couldn’t be easier, which is awesome when you have limited kitchen supplies. All you need is a frying pan and a covered pot. I started out by browning the duck for a bit of crispiness, then popped it into a pot with Newcastle Brown Ale, fennel, shallots, and garlic. 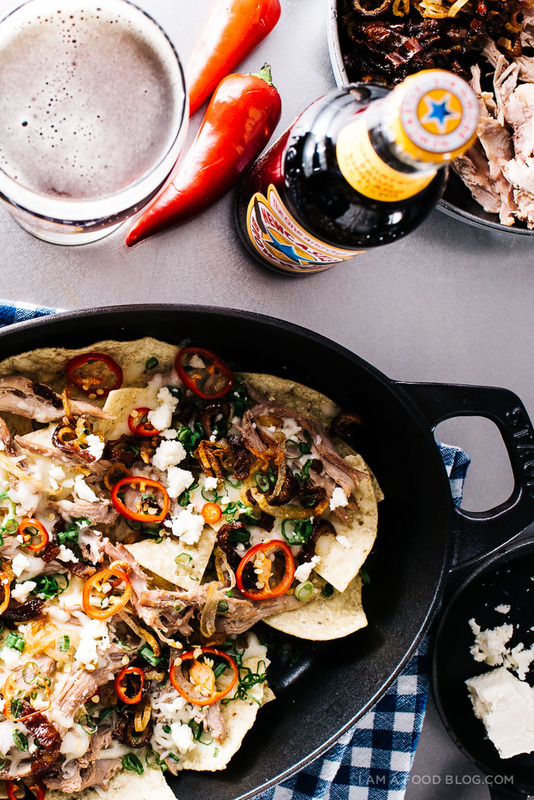 The beer adds a touch of caramel-y sweetness that goes fantastic with duck. After about an hour in its bubbly ale bath, I removed the skin from the duck and shredded the meat. The skin was sliced up and fried to make crispy duck cracklings. I also made some crispy shallots, using duck fat. 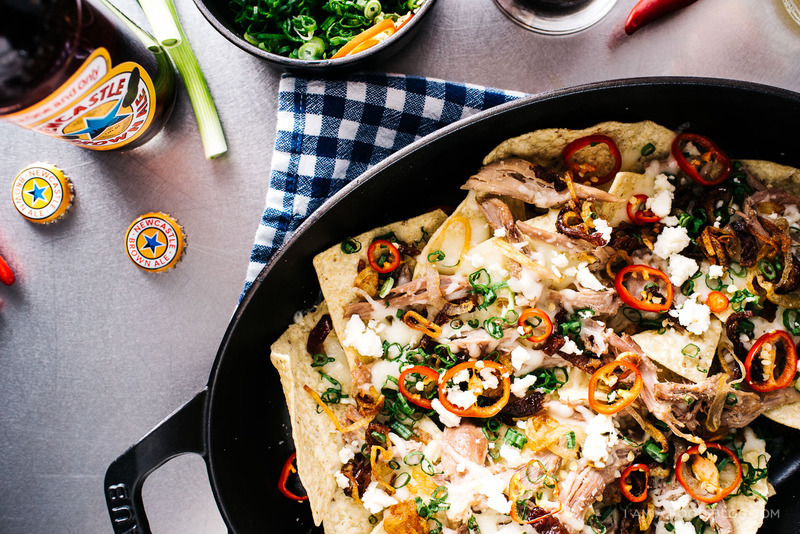 After that, it went something like this: a layer of tortilla chips, shredded duck, British cheddar, crispy duck cracklings, fried shallots, scallions, and sliced red chilis. 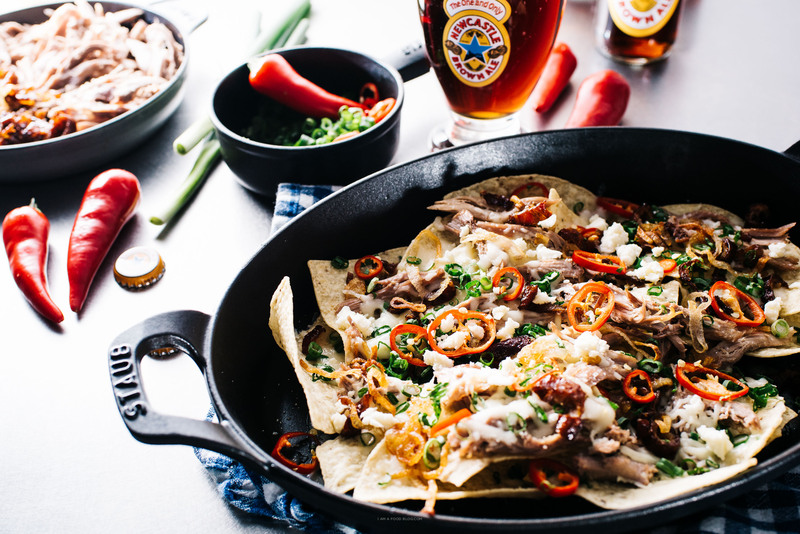 Serve with cold Newcastle Brown Ale and you’ve got yourself a nacho dream come true! Start off by browning the duck. Over medium heat, in a non-stick skillet, brown the skin of the duck until deeply golden and crispy, flipping as needed. Spoon off fat as it accumulates, and reserve. When crispy, remove and set aside. Find a small pot that the duck will fit into snuggly. Add a bit of duck fat, and fennel slices, garlic, and shallots. Cook over medium heat, stirring occasionally, until browned. Add half a cup of Newcastle Brown Ale and 1 1/2 cups of chicken stock. Bring to a gentle simmer. Add the duck into the pot, the liquid should come halfway up the duck. Adjust as necessary. Simmer on low, with the lid on, for 1 hour. While the duck is cooking, make the crispy shallots. Add the rendered duck fat and the sliced shallots to a cold pan. Cook over medium heat, stirring, until lightly browned. Remove and drain on paper towels. When the duck is cooked, remove from the cooking liquid and let rest for 10 minutes. Carefully remove the skin and cut into strips. Add the strips to a non-stick frying pan and cook over medium heat, stirring occasionally, until crispy. Remove from pan and let drain on paper towels. Shred the duck, taste, and season with salt and pepper if needed. Preheat the oven to 400°F. If desired, line a baking sheet with foil or parchment paper. Place a single layer of chips on your baking sheet. Top with pulled duck, then shredded cheeses. Sprinkle on the duck cracklings, shallots, green onions, and jalapeños. Repeat as needed, layering so each chip is fully loaded. Bake for 5-7 minutes, or until the cheese is gooey and melted. Top with the crumbled feta and enjoy immediately! Note: A duck crown is a bone in duck missing the legs. You can substitute 2 boneless duck breasts or 2 duck legs if desired. Adjust the amount of chicken stock, you want the liquid to come halfway up the duck. 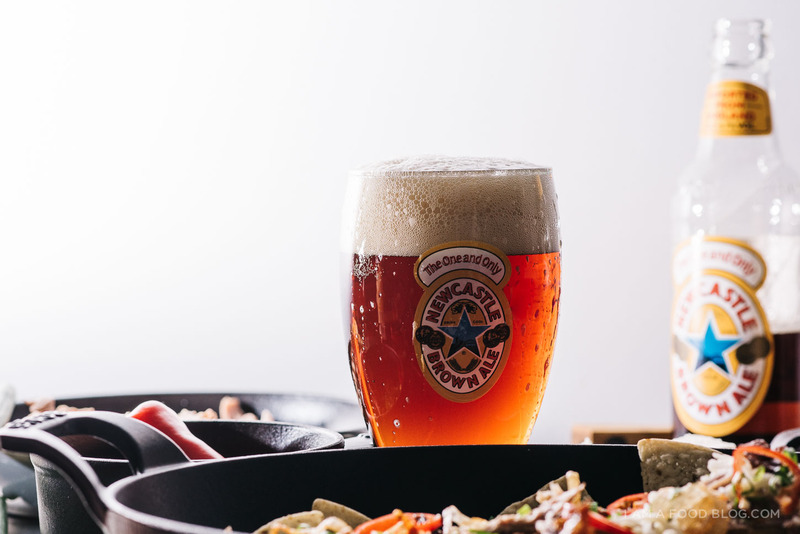 This post was sponsored by Newcastle Brown Ale. 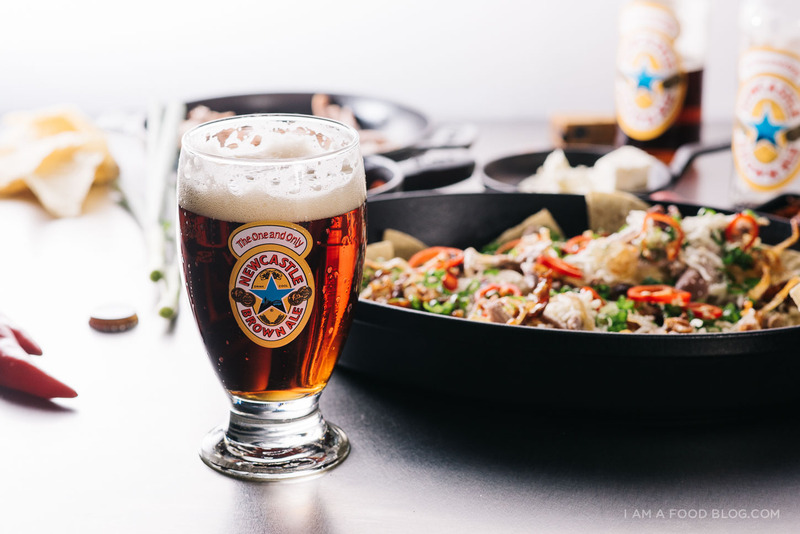 Newcastle Brown Ale is fantastic on its own and incredible when used when cooking – especially in holiday dishes. You can find it at retailers nationally. Thanks for supporting I am a Food Blog! Oh my, these nachos look so incredible! Craving these big time right now! I love your nacho memory!! Not weird at all. Nachos are one of the best things to eat when I get a salty cheesy greasy craving. Love the addition of duck too! Holy duck, Stephanie. This is totally off the chain! LUV THESE NACHOS but I might love your ghetto fab PS nachos more. They were so so good and every bite was perfection!! I love this post because it made me laugh and because I share your love for proper nachos, which London knows nothing about. I live in London but I used to live in BC so I get you! 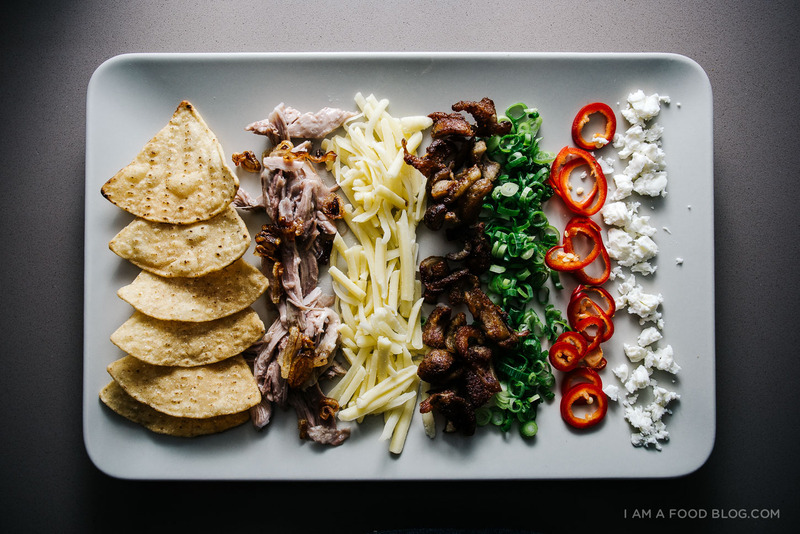 I am pinning this recipe for later because once New Year’s comes round we are going to need it and as you said duck is plentiful here and I’ve learned where to get tortilla chips, so we are good to go! TIP honestly the best tortilla chips I have found in the UK are Sainsbury’s basics tortilla chips. Like 50p a bag and I love them! I’m from Vancouver but I live in Brighton, lucky for me Mexican food has sort of exploded here and I can get my nacho fix easily!